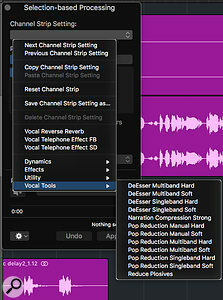 Screen 1: Applying a telephone effect to a section of a lead vocal is easy thanks to Logic’s Selection-based Processing. Simply add the telephone effect to Plug-in column A. 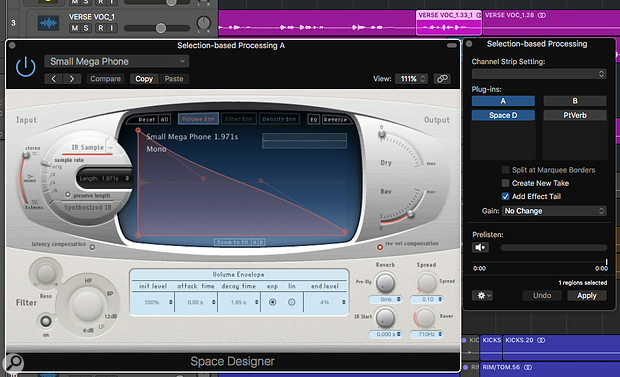 Here I am using the Small Mega Phone preset in Space Designer. Check the settings with the Pre-listen button and hit Apply to render the processing to a new region. 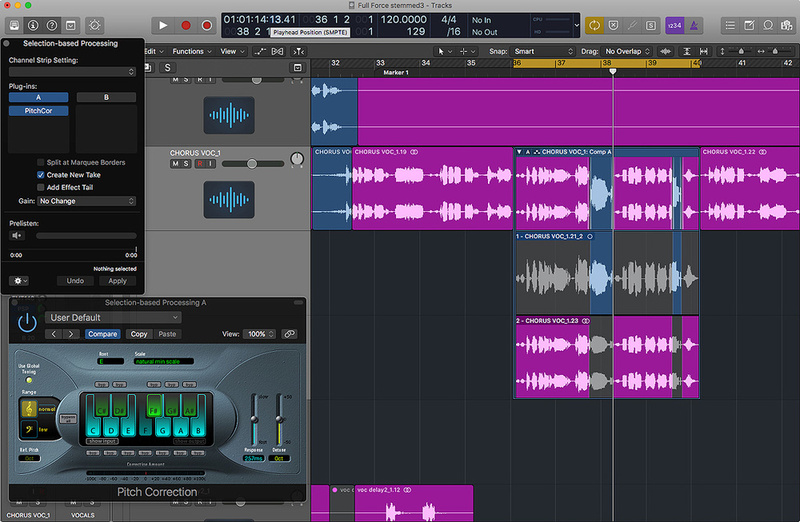 With Selection-based Processing in Logic Pro 10.3, adding effects to audio clips is now easier than ever. In this month’s Logic technique column, we’re going to explore Selection-based Processing. This is a new and long-requested feature added to Logic 10.3 that allows you to quickly render effects to single or multiple regions and marquee selections. Let’s begin by adding some different types of processing to a lead vocal. Start by loading a project that contains a lead vocal track. A common trick in popular music production is to apply a telephone effect to the vocal phrase to make it stand out from the rest of the mix. Go to the lead vocal track and use the Marquee Tool to select and chop out a small section of the lead vocal. Next, go to the Functions menu and click ‘Selection-based Processing’ to call up the Selection-based Processing window. The window is divided into two halves — plug-in column A and plug-in column B — of which only one can be active. Initially, it may seem odd to have two plug-in columns, but after you have used the feature for a while leaving multiple plug-in setups in place means that you can easily choose the appropriate one for the task. Let’s create a telephone effect on a lead vocal in plug-in column A. My favourite effect for this is McDSP’s Fuzzbox as it has a series of dedicated telephone presets that have a habit of just working really well. 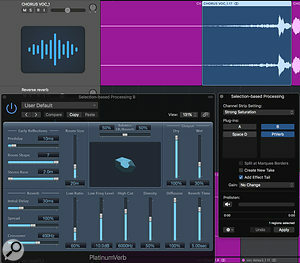 However, just as good results can be achieved with Logic’s included plug-ins. In column A add an instance of Logic’s Space Designer and from its preset menu go to Warped Effects/Speakers/Amp Pedal. Note that this preset requires the Reverb library to be installed from the Sound Library Manager. This should give you a basic telephone EQ sound (screen 1, above). Now, to make it more gritty, add an instance of Logic’s Overdrive plug-in to the second slot in column A and adjust the Drive and Tone parameters to taste. I settled for 8dB of Drive and a Tone setting of 6600Hz. To listen to the processing, simply click the region to which you want to apply the effect, then, within the Selection-based Processing window, click the speaker icon underneath the Pre-listen label. Logic helpfully loops the region and auditions the processing. In the bottom left-hand corner of the window there is a settings menu where you can configure the Pre-listen behaviour. Screen 2: The floating Selection-based Processing window makes it fast and easy to create reverse reverb effects. Here I have used plug-in column B with an instance of Platinumverb and ensured the Add Effect Tail parameter is ticked.Another treatment that Selection-based Processing makes a breeze is adding reverse reverb to a vocal (screen 2). Find a vocal phrase ideally somewhere in the arrangement where you are trying to create impact, for example the first word of a chorus. Use the Marquee tool to select the beginning of the vocal phrase and click to create a new region. Now select the region and from the Inspector’s Region area tick the Reverse parameter so that the region plays backwards. Go to the Selection-based Processing floating window and this time use column B so that we can still have easy access to our telephone effect. 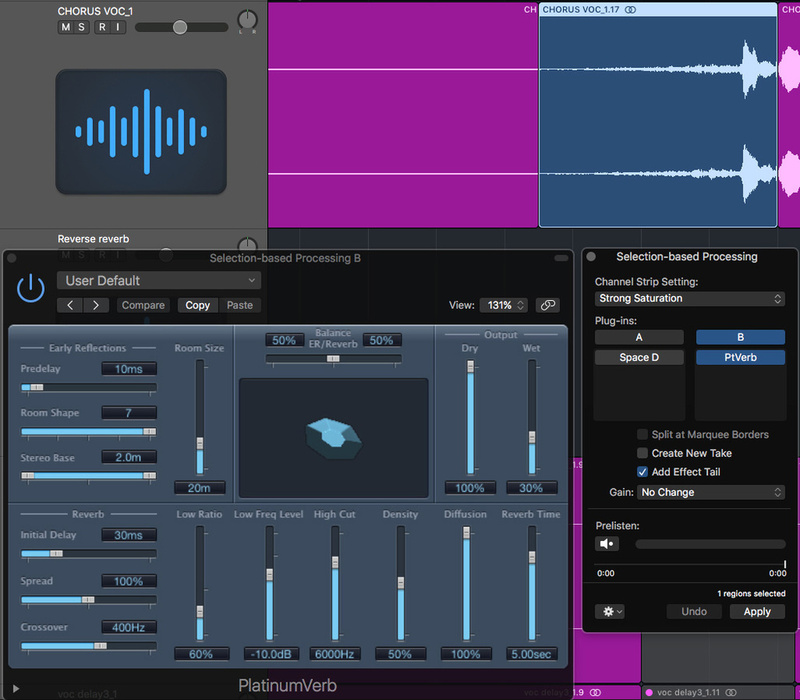 In Column B insert an instance of Platinumverb and tweak the factory default setting so that it has a Reverb Time of five seconds and a Wet Level around 30-40 percent. Go back to the Selection-based Processing window and tick the Add Effect Tail option, this will ensure that Logic bounces not only the Region with the effect but also the reverb tail. Hit Apply, and with the new region selected return back to the Region area of the Inspector and once again tick Reverse, this time to correct the direction. Now hover the mouse pointer over the start of the region and drag the region out to the left to reveal the reverb tail. Screen 3: The Selection-based Processing window comes with a selection of useful presets perfect for rudimentary tasks such as de-essing or removing plosives from a vocal phrase.As well as creative tasks, selection-based processing is also good for more rudimentary tasks such as cleaning up the bottom end of a vocal, de-essing any offending words and tuning any wayward phrases (screen 3). When recording vocals in less than perfect conditions it’s easy to get a bit of background rumble coming through into the mic. Adding an instance of Logic’s EQ to your vocal channel and clicking on the Analyzer should reveal if there is significant energy below 100Hz. If so, then we can use Selection-based Processing to remove this. Select all the regions on your vocal track and then from the Selection-based Processing window add a Channel EQ. In the Channel EQ click the High Pass Filter on and set the Frequency of the filter to around 100Hz. For higher voices such as a soprano you can set the filter considerably higher. Use the Pre-listen button to check you haven’t changed the bottom end in an undesirable way. There may be single words within your lead vocal that require more heavy-handed de-essing than others and rather than using automation to deal with them we can simply render those words or phrases through a de-esser, leaving the rest of the vocal untouched. 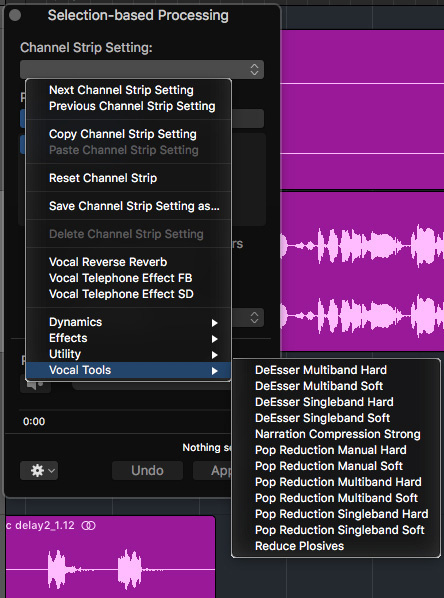 Identify a word that has an uncomfortable amount of high-frequency content, then use the Marquee tool to select the problem area, and from the Selection-based Processing preset menu choose the Vocal Tools/DeEsser Multiband Hard preset. Now use the Pre-listen function to tweak the Threshold parameter in band 4 of the Multipressor to give the required amount of high-frequency attenuation. When satisfied, hit Apply. Lastly, let’s look at a different way to tune a lead vocal phrase. I often find the pitch editors, like Flex Pitch, included in Logic X or Melodyne don’t work very well for me. Whilst they are highly capable it’s all too easy to lose perspective on a vocal performance when working at this level of detail. With that in mind I often prefer to tune a vocal by running it through a pitch-correction plug-in with a medium response time and comping the tuned version with the untuned in a take folder, and all of this becomes faster with Selection-based Processing. Use the Marquee tool to select a section of your lead vocal that contains some wayward tuning. Screen 4: Ticking the Create New Take option in the Selection-based Processing feature will create a take folder containing the unprocessed and processed audio regions. Here I have processed a problematic vocal phrase through Logic’s Pitch Correction plug-in and then I have comped the vocal, switching from the (untuned) bottom take to the (tuned) top take. Next, bring up the floating Selection-based Processing window and add an instance of Logic’s Pitch Correction plug-in. Call up the plug-in’s editing window and set the Scale to the key of the track. Now adjust the Response slider to a medium re-tune speed to make the tuning effect relatively subtle. I chose a value of 257ms. Return to the Selection-based Processing window and tick the Create New Take option followed by the Split at Marquee Borders option and then hit Apply. Logic conveniently creates a new take folder with our untuned region located at the bottom and our tuned region above. Select the bottom take and identify the areas where the vocal tuning needs attention and simply select those areas in the tuned take. Logic automatically crossfades between takes to give you a relatively seamless transition between the tuned and untuned material. Once you have comped your take, flatten it back down to a single audio region. Now that you have experienced using Selection-based Processing to create take folders, you can apply the same procedure to more off-the-wall treatments of other program material. For example, you could take a synth bass line, run it through some extreme modulation effects and then comp the two takes so that the bass part alternates between the original and the effected version at quarter-note intervals. Selection-based Processing is a long-overdue feature that Pro Tools and Digital Performer users have enjoyed for many years, and its addition to Logic X opens up a world of experimental processing techniques. It has very quickly become one of my favourite features and implementing it as a floating window was a master stroke.